Following the publication of a notice of impending expiry (1) of the countervailing measures in force on imports of certain polyethylene terephthalate originating in India (‘the country concerned’), the European Commission (‘the Commission’) has received a request for review pursuant to Article 18 of Council Regulation (EC) No 597/2009 of 11 June 2009 on protection against subsidised imports from countries not members of the European Community (2) (‘the basic Regulation’). The request was lodged on 25 November 2011 by the Polyethylene Terephthalate Committee of Plastics Europe (‘the applicant’) on behalf of Union producers representing a major proportion, in this case more than 50 %, of the Union production of certain polyethylene terephthalate. The product under review is polyethylene terephthalate having a viscosity number of 78 ml/g or higher, according to the ISO standard 1628-5, currently falling within CN code 3907 60 20 and originating in India (‘the product under review’). The measures currently in force are a definitive countervailing duty imposed by Council Regulation (EC) No 193/2007 (3). The applicant has provided sufficient evidence that the expiry of the measures would be likely to result in a continuation or recurrence of subsidisation and injury. First, the applicant alleges that the producers of the product under review in India have benefited and will continue to benefit from a number of subsidies granted by the Government of India. These alleged subsidies consist of benefits for industries located in export processing zones/export oriented units; the advance authorisation scheme; the duty entitlement passbook scheme; the export promotion capital goods scheme; the export credit scheme; the focus market scheme; the focus product scheme; the capital investment incentive scheme of the Government of Gujarat; the Gujarat sales tax incentive scheme; the Gujarat electricity duty exemption scheme and the West Bengal incentive scheme. The total subsidy is estimated to be significant. The applicant alleges that the above schemes are subsidies since they involve a financial contribution from the government of India or other regional governments and confer a benefit to the recipients, i.e. to exporting producers of certain polyethylene terephthalate. They are alleged to be contingent upon export performance and therefore specific and countervailable or to be otherwise specific and countervailable. In addition, the applicant has provided evidence that the imports of the product under review from India have increased overall in absolute terms and in terms of market share. Second, the request is based on the grounds that the expiry of the measures would be likely to result in the recurrence of injury to the Union industry due to the continuation of subsidised imports of the product under review from India. The prima facie evidence provided by the applicant shows that the volumes and the prices of the imported product under review are likely to have, among other consequences, a negative impact on level of prices charged by the Union industry, resulting in substantial adverse effects on the overall performance of the Union industry. Finally, the applicant alleges that the removal of injury has been mainly due to the existence of the measures and that, should measures be allowed to lapse, any continuation of substantial subsidised imports from the country concerned would likely lead to recurrence of injury to the Union industry. Having determined, after consulting the Advisory Committee, that sufficient evidence exists to justify the initiation of an expiry review, the Commission hereby initiates a review in accordance with Article 18 of the basic Regulation. The investigation will determine whether the expiry of the measures would be likely, or unlikely, to lead to a continuation of subsidisation and recurrence of injury. Exporting producers (4) of the product under review from the country concerned are invited to participate in this review investigation. In view of the potentially large number of exporting producers in India involved in this proceeding and in order to complete the investigation within the statutory time limits, the Commission may limit the exporting producers to be investigated to a reasonable number by selecting a sample (this process is also referred to as ‘sampling’). The sampling will be carried out in accordance with Article 27 of the basic Regulation. In order to enable the Commission to decide whether sampling is necessary, and if so, to select a sample, all exporting producers, or representatives acting on their behalf, are hereby requested to make themselves known to the Commission. These parties have to do so within 15 days of the date of publication of this notice in the Official Journal of the European Union, unless otherwise specified, by providing the Commission with information on their company(ies) as requested in Annex A to this notice. In order to obtain the information it deems necessary for the selection of the sample of exporting producers, the Commission will also contact the authorities of India and may contact any known association of exporting producers. All interested parties wishing to submit any other relevant information regarding the selection of the sample, excluding the information requested above, must do so within 21 days of the publication of this notice in the Official Journal of the European Union, unless otherwise specified. If a sample is necessary, the exporting producers may be selected based on the largest representative volume of exports of the product under review to the Union which can reasonably be investigated within the time available. All known exporting producers, the authorities of the country concerned and associations of exporting producers will be notified by the Commission, via the authorities of the country concerned if appropriate, of the companies selected to be in the sample. In order to obtain the information it deems necessary for its investigation with regard to exporting producers, the Commission will send questionnaires to the exporting producers selected to be in the sample, to any known association of exporting producers and to the authorities of the country concerned. All exporting producers selected to be in the sample will have to submit a completed questionnaire within 37 days from the date of notification of the sample selection, unless otherwise specified. The questionnaire will contain information on, inter alia, the structure of the exporting producer's company(ies), the activities of the company(ies) in relation to the product under review, the cost of production, the sales of the product under review on the domestic market of the country concerned and the sales of the product under review to the Union. Companies that had agreed to their possible inclusion in the sample but were not selected to be in the sample shall be considered to be cooperating (‘non-sampled cooperating exporting producers’). Unrelated importers of the product under review from India to the Union are invited to participate in this review investigation. 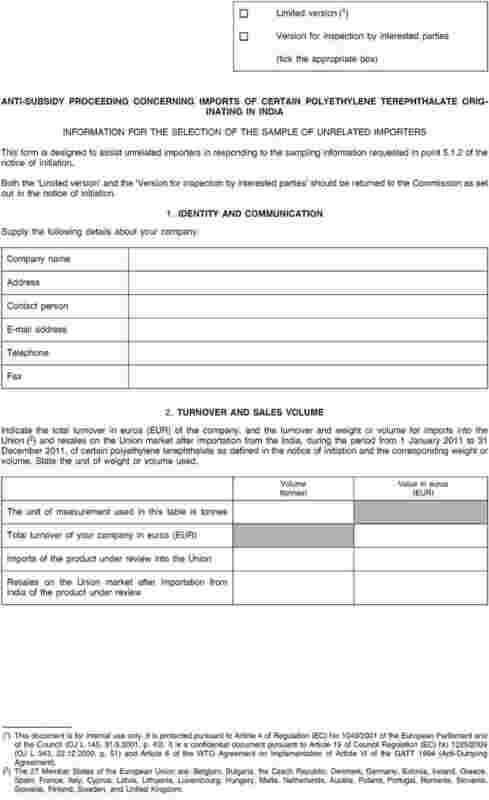 In view of the potentially large number of unrelated importers involved in this proceeding and in order to complete the investigation within the statutory time limits, the Commission may limit to a reasonable number the unrelated importers that will be investigated by selecting a sample (this process is also referred to as ‘sampling’). The sampling will be carried out in accordance with Article 27 of the basic Regulation. In order to enable the Commission to decide whether sampling is necessary and, if so, to select a sample, all unrelated importers, or representatives acting on their behalf, are hereby requested to make themselves known to the Commission. These parties must do so within 15 days of the date of publication of this notice in the Official Journal of the European Union, unless otherwise specified, by providing the Commission with the information on their company(ies) requested in Annex B to this notice. In order to obtain the information it deems necessary for the selection of the sample of unrelated importers, the Commission may also contact any known associations of importers. If a sample is necessary, the importers may be selected based on the largest representative volume of sales of the product under review in the Union which can reasonably be investigated within the time available. All known unrelated importers and associations of importers will be notified by the Commission of the companies selected to be in the sample. In order to obtain the information it deems necessary for its investigation, the Commission will send questionnaires to the sampled unrelated importers and to any known association of importers. These parties must submit a completed questionnaire within 37 days from the date of the notification of the sample selection, unless otherwise specified. The questionnaire will contain information on, inter alia, the structure of their company(ies), the activities of the company(ies) in relation to the product under review and on the sales of the product under review. In order to establish whether there is a likelihood of recurrence of injury to the Union industry, Union producers of the product under review are invited to participate in this review investigation. In view of the large number of Union producers involved in this proceeding and in order to complete the investigation within the statutory time limits, the Commission has decided to limit to a reasonable number the Union producers that will be investigated by selecting a sample (this process is also referred to as ‘sampling’). The sampling is carried out in accordance with Article 27 of the basic Regulation. The Commission has provisionally selected a sample of Union producers. Details can be found in the file for inspection by interested parties. Interested parties are hereby invited to consult the file (for this they should contact the Commission using the contact details provided in Section 5.6 below). Other Union producers, or representatives acting on their behalf, that consider that there are reasons why they should be included in the sample must contact the Commission within 15 days of the date of publication of this notice in the Official Journal of the European Union. All interested parties wishing to submit any other relevant information regarding the selection of the sample must do so within 21 days of the publication of this notice in the Official Journal of the European Union, unless otherwise specified. All known Union producers and/or associations of Union producers will be notified by the Commission of the companies finally selected to be in the sample. In order to obtain the information it deems necessary for its review investigation, the Commission will send questionnaires to the sampled Union producers and to any known association of Union producers. These parties must submit a completed questionnaire within 37 days from the date of the notification of the sample selection, unless otherwise specified. The questionnaire will contain information on, inter alia, the structure of their company(ies), the financial situation of the company(ies), the activities of the company(ies) in relation to the product under review, the cost of production and the sales of the product under review. Should the continuation of subsidisation and the recurrence of injury be confirmed, a decision will be reached, pursuant to Article 31 of the basic Regulation, as to whether the maintenance the anti-subsidy measures would not be against the Union interest. Union producers, importers and their representative associations, users and their representative associations, and representative consumer organisations are invited to make themselves known within 15 days of the date of publication of this notice in the Official Journal of the European Union, unless otherwise specified. In order to participate in the investigation, the representative consumer organisations have to demonstrate, within the same deadline, that there is an objective link between their activities and the product under review. Parties that make themselves known within the above deadline may provide the Commission with information on the Union interest within 37 days of the date of publication of this notice in the Official Journal of the European Union, unless otherwise specified. This information may be provided either in a free format or by completing a questionnaire prepared by the Commission. In any case, information submitted pursuant to Article 31 will only be taken into account if supported by factual evidence at the time of submission. Subject to the provisions of this notice, all interested parties are hereby invited to make their views known, submit information and provide supporting evidence. Unless otherwise specified, this information and supporting evidence must reach the Commission within 37 days of the date of publication of this notice in the Official Journal of the European Union. All interested parties may request to be heard by the Commission investigation services. Any request to be heard should be made in writing and should specify the reasons for the request. For hearings on issues pertaining to the initial stage of the investigation the request must be submitted within 15 days of the date of publication of this notice in the Official Journal of the European Union. Thereafter, a request to be heard must be submitted within the specific deadlines set by the Commission in its communication with the parties. All written submissions, including the information requested in this notice, completed questionnaires and correspondence provided by interested parties for which confidential treatment is requested shall be labelled ‘Limited’ (7). Interested parties providing ‘Limited’ information are required to furnish non-confidential summaries of it pursuant to Article 29(2) of the basic Regulation, which will be labelled ‘For inspection by interested parties’. These summaries should be sufficiently detailed to permit a reasonable understanding of the substance of the information submitted in confidence. If an interested party providing confidential information does not furnish a non-confidential summary of it in the requested format and quality, such confidential information may be disregarded. In cases where any interested party refuses access to or does not provide the necessary information within the time limits, or significantly impedes the investigation, provisional or final findings, affirmative or negative, may be made on the basis of facts available, in accordance with Article 28 of the basic Regulation. Where it is found that any interested party has supplied false or misleading information, the information may be disregarded and use may be made of facts available. If an interested party does not cooperate or cooperates only partially and findings are therefore based on facts available in accordance with Article 28 of the basic Regulation, the result may be less favourable to that party than if it had cooperated. Interested parties may request the intervention of the Hearing Officer of Directorate-General for Trade. The Hearing Officer acts as an interface between the interested parties and the Commission investigation services. The Hearing Officer reviews requests for access to the file, disputes on the confidentiality of documents, requests for extension of time limits and requests by third parties to be heard. The Hearing Officer may organise a hearing with an individual interested party and mediate to ensure that the interested parties’ rights of defence are being fully exercised. A request for a hearing with the Hearing Officer should be made in writing and should specify the reasons for the request. For hearings on issues pertaining to the initial stage of the investigation the request must be submitted within 15 days of the date of publication of this notice in the Official Journal of the European Union. Thereafter, a request to be heard must be submitted within specific deadlines set by the Commission in its communication with the parties. The Hearing Officer will also provide opportunities for a hearing involving parties to take place which would allow different views to be presented and rebuttal arguments offered on issues pertaining, among others, to the likelihood of continuance of subsidisation and of recurrence of injury and Union interest. As this expiry review is initiated in accordance with the provisions of Article 18 of the basic Regulation, the findings thereof will not lead to the level of the existing measures being amended but will lead to those measures being repealed or maintained in accordance with Article 22(3) of the basic Regulation. If any interested party considers that a review of the level of the measures is warranted so as to allow for the possibility to amend (i.e. increase or decrease) the level of the measures, that party may request a review pursuant to Article 19 of the basic Regulation. Parties wishing to request such a review, which would be carried out independently of the expiry review mentioned in this notice, may contact the Commission at the address given above. The investigation will be concluded, according to Article 22(1) of the basic Regulation, within 15 months of the date of the publication of this notice in the Official Journal of the European Union. Any personal data collected in this investigation will be treated in accordance with Regulation (EC) No 45/2001 of the European Parliament and of the Council on the protection of individuals with regard to the processing of personal data by the Community institutions and bodies and on the free movement of such data (8). (1) OJ C 116, 14.4.2011, p. 10. (2) OJ L 188, 18.7.2009, p. 93. (3) OJ L 59, 27.2.2007, p. 34. (4) An exporting producer is any company in the country concerned which produces and exports the product under investigation to the Union market, either directly or via third party, including any of its related companies involved in the production, domestic sales or exports of the product concerned. (5) Only importers not related to exporting producers can be sampled. Importers that are related to exporting producers have to fill in Annex I to the questionnaire for these exporting producers. In accordance with Article 143 of Commission Regulation (EEC) No 2454/93 concerning the implementation of the Community Customs Code, persons shall be deemed to be related only if: (a) they are officers or directors of one another’s businesses; (b) they are legally recognised partners in business; (c) they are employer and employee; (d) any person directly or indirectly owns, controls or holds 5 % or more of the outstanding voting stock or shares of both of them; (e) one of them directly or indirectly controls the other; (f) both of them are directly or indirectly controlled by a third person; (g) together they directly or indirectly control a third person; or (h) they are members of the same family. Persons shall be deemed to be members of the same family only if they stand in any of the following relationships to one another: (i) husband and wife; (ii) parent and child; (iii) brother and sister (whether by whole or half blood); (iv) grandparent and grandchild; (v) uncle or aunt and nephew or niece; (vi) parent-in-law and son-in-law or daughter-in-law; (vii) brother-in-law and sister-in-law. (OJ L 253, 11.10.1993, p. 1). In this context ‘person’ means any natural or legal person. (6) The data provided by unrelated importers may also be used in relation to aspects of this investigation other than the determination of dumping. (7) A ‘Limited’ document is a document which is considered confidential pursuant to Article 19 of Council Regulation (EC) No 1225/2009 (OJ L 343, 22.12.2009, p. 51) and Article 6 of the WTO Agreement on Implementation of Article VI of the GATT 1994 (Anti-Dumping Agreement). It is also a document protected pursuant to Article 4 of Regulation (EC) No 1049/2001 of the European Parliament and of the Council (OJ L 145, 31.5.2001, p. 43). (8) OJ L 8, 12.1.2001, p. 1.